This article was written by Max Markel. 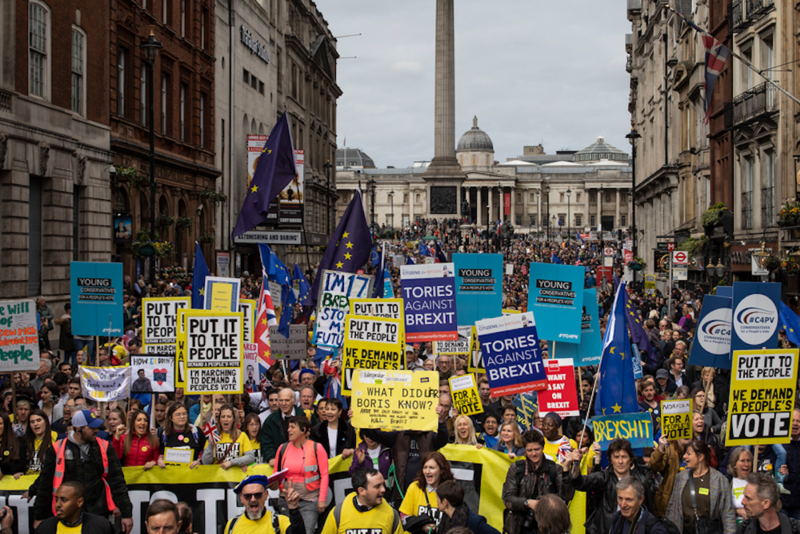 On March 23, people took to the streets of London to protest Britain’s departure from the European Union, known as “Brexit”. 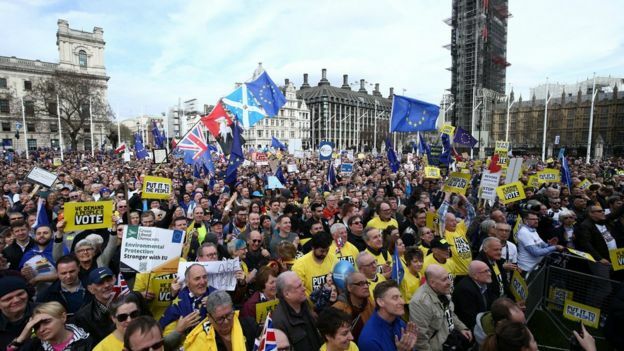 Called the “Put it to the People Vote” March and organized by the People’s Vote campaign, the march calls for a public vote on details of the Brexit negotiations. This vote would take the form of another referendum. Organizers of the march estimate that over one million people participate in the march; if accurate, making it one of the biggest demonstrations Britain has seen since the 2003 Stop the War march protesting the War in Iraq. Simultaneously, there is a pro-Brexit “March to Leave” heading from Sunderland to London, which includes Eurosceptic United Kingdom Independence Party Leader Nigel Farage. European Union symbols dominated the march, including flags and sings including slogans such as “Forget the Ides of March – beware the Brexit of May”, “Brexit is treason”, and, on a more playful note, “Never gonna give EU up”. The common chant uniting the crowd clearly outlined their intent: “What do we want? People’s vote. When do we want it? Now!” Participants and speakers at the rally included the Labour Party’s deputy leader Tom Watson, Scotland’s First Minister Nicola Sturgeon, and London Mayor Sadiq Khan. “I can only vote for a deal if you let the people vote on it too. Prime Minister, you’ve lost control of this process, you’re plunging into chaos, let the people take control,” said Watson. Originally, the United Kingdom was set to leave the European Union by March 29. However, EU leaders provided a lifeline in the form of a delay in order to avoid a “no-deal Brexit”. However, this “delay” has two different dates: If Prime Minister Theresa May passes her withdrawal agreement by Parliament, the delay is until May 22. If her agreement fails to pass, the United Kingdom could only remain in the EU until April 12and would have to present a clear plan of action. In a televised speech mid-March, May stated that she was still determined to follow through on Brexit. Blaming Parliament for the halt on negotiations, she assured the British pro-Leave public with “I am on your side.” Backlash against her statement was almost immediate, with an online petition calling to cancel Brexit through revoking Article 50 gaining over four million signatures by March 23. Recent events show that the trend of May losing control will continue. On March 26, Parliament voted 329 to 302 in favor of an amendment to take control away from government ministers and vote in a series of indicative votes, which are non-binding, on whether a certain “Brexit option” maintains a majority with Parliament. These indicative votes only confirm May’s declining control over Brexit, an act she sees as “overturn[ing] the balance of our democratic institutions”. The amendment was put forth by Conservative MP Oliver Letwin and Labour MP Hilary Benn. In another blow to May’s control, 30 Conservative members voted against the government and three resigned from their positions. The seizure of control was the first of its kind in over a century. To be voted upon on March 27, the Brexit options vary in scope and repercussion. These options include May’s deal; a customs union with the EU; a “soft-Brexit” or “Norway-style relationship” in which the United Kingdom would have full access to the EU’s single market with very limited restrictions to trade; a second referendum; a no-deal Brexit; or, perhaps the most dramatic, cancelling Brexit altogether. Although the votes are non-binding, the results ultimately show the will of Parliament. Since the 2016 vote, attitudes towards Brexit and EU membership have shifted. Originally 52% to 48% in favor of leaving, now there is a slight majority in favor of remaining in the bloc. Another survey showed that nearly eighty percent of British citizens handled Brexit negotiations with the EU “badly” and nearly fifty-five percent would now vote to remain. Nearly two-thirds of respondents to a March snap poll showed that two-thirds of British citizens preferred EU membership than leaving the union with May’s most recent deal. Officials mark this shift as a result of changing demographics, with younger individuals, who are overwhelmingly pre-European Union, are now of voting age. Ultimately, May aims to pass her twice-rejected Brexit deal. Two days after the protest, the House of Commons assured that her deal was unlikely to be passed. On March 27, May announced that she will stand down if the deal is passed. “I ask everyone in this room to back the deal so we can complete our historic duty – to deliver on the decision of the British people and leave the European Union with a smooth and orderly exit,” said May. With returning to the EU with a different plan difficult, the future of Brexit remains uncertain.